You can (and should!) plan your wedding photography around the sunset for the time of year your wedding is being held. All photographers will tell you that the 'right light' is the most important aspect of photography, and that evening light close to sunset is softer, more saturated with colour, and generally, much better for your wedding photos. 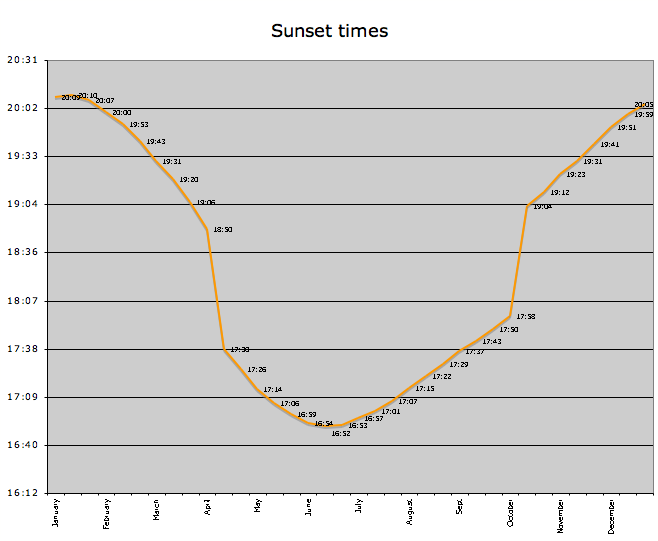 Below is a list and graph of the sunset times for Sydney NSW so you can better plan your wedding to get the best light. Please note that new legislation changed the daylight savings times for Sydney NSW in 2009. We have recently updated this page with new dates for the 2012 and 2013 daylight savings times, see below for details. For more wedding planning tips see our articles page. Check your wedding date on the table or graph and try to schedule your wedding location photos around the sunset time. Ideally the ceremony would finish 2-3 hours before sunset, and you will have 1-2 hours of photography before the sun sets. Then you can start the wedding reception knowing you've had the best light for your photos! What does this mean for wedding photos? If you are getting married in early April your sunset time will be one hour earlier than previously expected. Equally, if you are getting married in October you will get a sunset time one hour later. Make sure you check with your photographer that these new times wont cause issues for your photos.